The governor, who axed a bill to hike the minimum wage Tuesday, now has 33 more vetoes than Longley in '77. AUGUSTA — Gov. Paul LePage issued 21 vetoes on Monday, cementing his place in the state record books. In a flurry of actions late Monday afternoon and evening, the governor set aside legislation that would have raised the state’s minimum wage, allowed public funding for charter schools, regulated the use of drones by law enforcement agencies, and established a preference in state purchasing for American-made products. The Legislature will reconvene Tuesday and have an opportunity to override LePage’s vetoes. That would require a two-thirds vote in both the House and Senate. Monday’s slew of vetoes brings LePage’s total for the current legislative session to 82 — 33 more than the record of 49 set in 1977 by independent Gov. James Longley. More vetoes could be issued Tuesday by the governor. Among the bills LePage axed on Monday was L.D. 611, an act that would have raised the state’s minimum wage from $7.50 an hour to $9 by 2016 and then raise it occasionally for inflation. 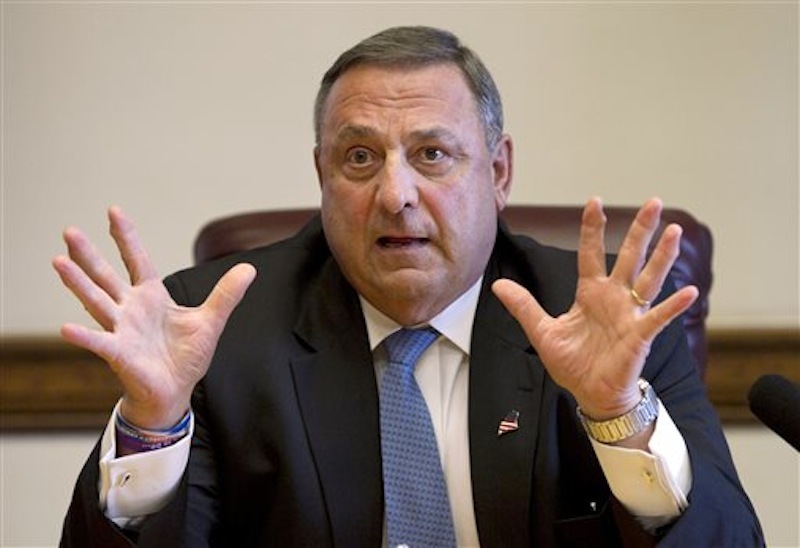 In his veto message, LePage said, “Too many people are worried about the bare minimum, wages or otherwise.” He the state should focus on lowering energy costs and reducing the tax burden. L.D. 236 would have set up protections for citizen privacy by regulating the use of unmanned aerial vehicles — also known as drones — by law enforcement agencies. “This bill steps too far, creating more private rights of action, leading to more lawsuits. Creating more litigation will do nothing to help our overburdened court system, especially when we do not have a drone problem in Maine,” LePage wrote in his veto message. The governor said he plans to sign an executive order directing the commissioner of public safety to establish guidelines around the use of drones by law enforcement agencies. The bill would have established a new program budget in the Department of Education to fund public charter schools. LePage said the law would have allowed the Legislature to target charter schools and their offerings by reducing the amount of available funds. L.D. 890 would have established a state purchasing policy that favors the purchase of American-made goods. “Letting this bill become law would say to American workers that their products cannot compete unless the deck is stacked in their favor. I cannot and I will not say that,”LePage wrote in his veto message.